Barnes Hill Big Break - JACKPOT! Fortune found its way to Barnes Hill on Monday 16th November where a local couple, John and Marleen Copper, triumphed by winning the National Bingo Game Jackpot. 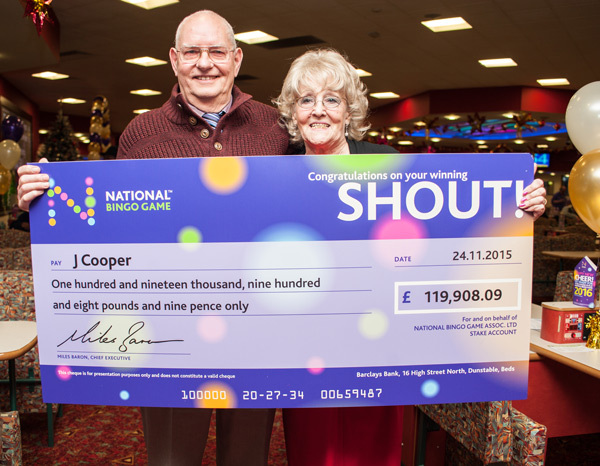 The National Prize and Jackpot prize totalled over £117,000 making this bingo session a very successful one. The National Bingo Game's Alastair Stewart said, "This is a fantastic prize wins and we send our congratulations to John and Marleen. It was a pleasure to be able to present them with their cheque and to see another national Bingo Game Jackpot win, especially in the Christmas season." The delighted couple stepped in to say "This is the best day of our lives! It's been a very happy day for us and our family." Jemma Carter-Jones, General Manager at Castle Bingo Barnes Hill added " We're simply over the moon for this recent National Game Jackpot winner! We weren't expecting such a huge win for a Monday afternoon. It's such an incredible sum of money and will definitely help with the forthcoming Christmas shopping. It was lovely to celebrate with the winners at the club." Staff members of Castle Bingo Barnes Hill held a celebratory party on Tuesday 24th November for John and Marleen, and their family and friends, to acknowledge their Jackpot win.